This picture from a warmer Sunday than the one I witnessed featured a little more life in the pool. 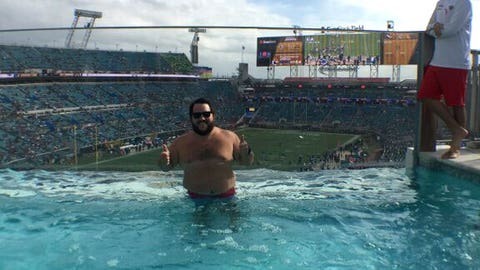 That was the combination of reaction and advice I got from a fellow journalist Sunday morning when I told him my assignment for the Jaguars-Texans AFC South showdown was to watch the game from one of the two swimming pools overlooking EverBank Field. A ringing endorsement of one of the NFL’s most unique stadium amenities it was not, but as I spent the next four hours unwittingly getting sunburned through the clouds, I found the FanDuelVille Smart Pharmacy Spa Cabana — a mouthful of a branded name — to be far more charming and far less icky than I’d been led to believe, even if the experience was not my cup of tea. My day at the pool actually started in earnest two hours south of Jacksonville in Orlando, staring at a disheveled armoire at 8 a.m., trying to decide which swimsuit to pack for the first shirtless assignment of my career. Normally not among my top concerns when swimming, fashion suddenly seemed important given the atmosphere I’d be immersing myself in throughout the day. And while I understood that no bathing suit was going to magically give me abs like Joe Manganiello, I figured if I was going to get in the pool in front of a bunch of good-looking strangers, I might as well at least look like I was trying. Getting off to a hot start doesn't mean much in the NFL. Just ask these teams who collapsed down the stretch. But then I got to the stadium, made my way to the party deck and a funny thing happened: For starters, no one else looked like Joe Manganiello — except for one guy in a Gold’s Gym tank top who looked like Joe Manganiello ate Joe Manganiello — and perhaps even more surprisingly, not one of the people who paid a minimum of $250 a head to sit poolside was even in the pool. In fact, it wasn’t until just before kickoff that the first brave soul — a shapeless 30-something in American flag board shorts and a well-worn Steelers hat — even took a dip, followed shortly thereafter by his buddy in a Cowboys hat, a guy in a 49ers flat-brim and a bro in a Los Angeles Angels cap (all of them backward, naturally). Eventually, the collection of dudes rooting for everyone but the teams they were watching was joined by a small gathering of Texans fans, each of whom got in still wearing jerseys for a quick photo op, and over the course of the first quarter, another dozen or so fans paid their seemingly obligatory visit to the spa. But by the end of the quarter, the water was calm, the pool was once again empty as swimmers returned to their food and drinks, and it would remain that way for most of the next hour. Now to be fair, some of the timidity to make a splash likely had to do with the weather. A mid-October cold front had come through overnight, leaving northern Florida unseasonably frigid for this time of year — it was 68 degrees at kickoff, brrrrr — and that, combined with unusually gusty winds, a general lack of sunshine and the absence of free towels made the prospect of getting soaking wet seem more questionable than usual. I should also mention the part where fans are not allowed to bring alcohol in the pool, a rule that certainly may have deterred those who couldn’t bear to part with their Jags-themed Bud Light cans. However, when the Bethune-Cookman band took the field at halftime, I, too, was still wearing jeans and a polo — and I wasn’t even drinking — so certainly, there was more to it than that. 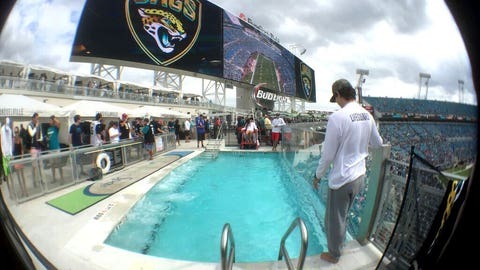 The Jaguars’ pools aren’t nearly as big as the their scoreboards, but they’re still an attraction — when it isn’t cold. Finally, I asked a lifeguard — yes, even 3-foot-deep pools have lifeguards — if what I was witnessing was normal for game day on the spa deck, and she assured me that it was not. Generally speaking, the lifeguards keep the capacity in each pool at a maximum of 24, and when the weather and the crowd are right, getting in the water can mean standing in a line of bikini-clad babes and Men’s Health cover models for the right to do so. For the reasons detailed earlier, this wasn’t one of those games, and it’s likely no one would have noticed had I not gotten in myself. But I felt I’d be remiss if I didn’t partake in the full experience. So in the spirit of professionalism, I changed, disrobed and slinked in during the second half — so as to not embarrass myself, I waited until Manganiello2 got out — and you know what? It wasn’t that bad. By that time, the sun was at least trying to peek out, the water felt nice — in what may have been a bit of overkill, they turned on heaters for the game — and the view of the field was great, even if the play on it could have been better. 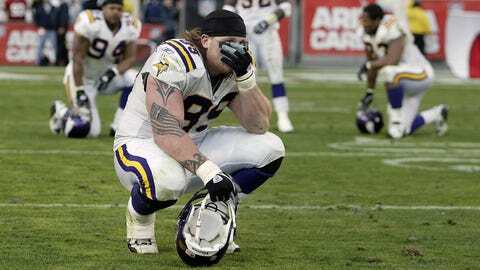 It beat the heck out of trying to see the action through a wall of guys wearing non-Jags jerseys (the best I saw was a tattered John Randle relic) or craning my neck to watch on the massive, breathtaking video boards, and I wished I’d been doing it all game. But even with my newfound appreciation for the pool in mind — and knowing full well that a few frosty beverages and some of the delicious catered food would only further improve the experience — I’m not exactly clamoring for another chance to enjoy a game from the party deck, if only because the spa cabana experience makes a football game feel so little like a football game. I have no doubt that there are plenty for whom a pool deck and a game are a match made in heaven, but for me, there’s something to be said for being in the stands among the regular folks, fans who live and die with the team on the field. For all of its incredible amenities, the one thing the Jaguars’ splash pad lacks is the atmosphere that makes football football. I just had to test the waters. If nothing else, you can’t beat the view of the field. One of the loudest cheers I heard from the fans around me all afternoon came from a handful of Broncos fans reacting to a replay of Aqib Talib’s pick-six against the Browns on a FanDuelVille video screen tuned to the NFL RedZone channel. When Blake Bortles threw an interception inside the Houston 10-yard line with less than 10 seconds left in the first half, it didn’t even register a boo from the VIPs in attendance. One poolside Jags fan I talked to said it felt more like watching a game on TV than actually being there, and I’d be lying if I said he didn’t have a point. That’s not any fault of the fans or the Jaguars, of course. The team has done an incredible job improving the gameday experience over the past couple seasons, and it’s safe to say that groups paying $12,000 to enjoy a poolside cabana at a football stadium are likely more interested than the party than the football. For them, the poolside experience is everything it’s advertised to be, and the people around me seemed to be having a great time — especially the bachelor party that asked me at one point if my backpack was full of Molly. (It was not.) But for my money — and maybe I’m just crazy — I’d just as soon sit on the 50 with this guy than watch from afar and worry about which bathing suit makes me look the least fat.